When Apollo 17 astronauts Gene Cernan and Harrison Schmitt left the lunar surface for the last time in 1972, many viewed the moon as a dry and barren world, with little to offer beyond flags and footprints for superpowers — a prize that had been clearly won by the United States. Fast-forward almost a half-century later, and a lot has changed. Our scientific and strategic understanding of the moon and its resource potential has expanded dramatically. Recent robotic missions to the moon have discovered vast water ice resources at the lunar poles. Persistent peaks of light at the lunar poles have been found to offer near-continuous solar illumination for surface operations. City-sized underground lunar lava tubes have been discovered. Advances in in-situ resource utilization (ISRU) technology have brought the dream of harvesting fuel from the moon within our grasp. Meanwhile, large-scale exploration vehicles in the form of NASA’s Orion and Space Launch System are imminently coming online, just as international interest in the moon is peaking. Space agencies the world over have announced plans for near-term Moon missions. New agencies like Agencia Espacial Mexicana, and even private companies like DHL, can now reach the moon by partnering with commercial lunar providers like Astrobotic. In fact, Astrobotic already has 11 such customers representing six countries for our first Peregrine cargo delivery mission to the Moon, which will be launched on the United Launch Alliance Atlas 5 rocket. How, then, do we strategically unite this groundswell of interest from the administration and NASA with international and commercial partners in a way that fosters a sustainable ecosystem of exploration and commerce on and around the moon? How do we best leverage NASA’s current investments and upcoming exploration missions in a manner that best supports America’s exploration, geopolitical, and economic interests? 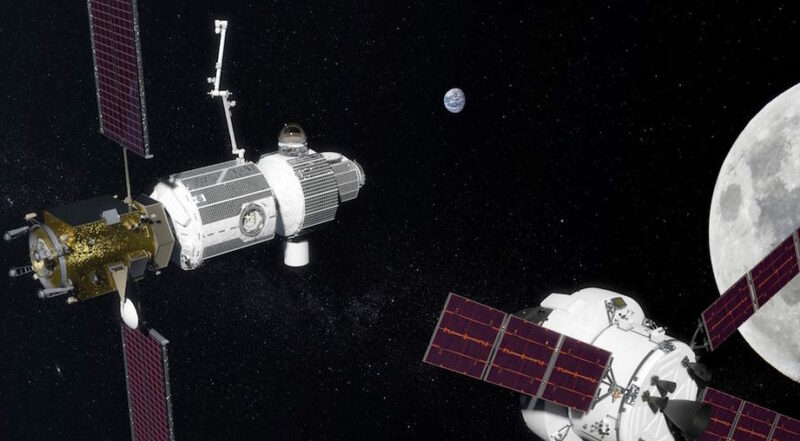 The answer lies with NASA’s proposed Deep Space Gateway (DSG). As NASA has outlined, the DSG has the potential to be an ideal platform for re-establishing and securing a sustainable American lunar presence by demonstrating technology, proving an exploration architecture, and acquiring much-needed experience for deep space missions to destinations like Mars. At the same time, the DSG’s lunar proximity and permanent presence would present an unprecedented opportunity to advance near-term surface exploration and development. It will give NASA, as well as international and commercial partners, including Astrobotic, a long-term platform from which to support our lunar activities. All future lunar missions would greatly benefit from using the DSG as a communication relay. Communication capabilities at the DSG could open entire regions of the moon to robotic landers and payloads, such as the lunar farside, skylights, and craters. Its proximity would enable much greater communication speeds through radio and laser communication. The DSG’s proximity to the moon could unleash a whole class of small-scale mobile surface vehicles, which would otherwise be constrained by staying in the line of sight with surface relay assets. Additionally, the DSG could become the first node in a lunar GPS system. U.S. government assets in Earth’s orbit have been essential in developing new industries leveraging GPS, observation, and other applications. The DSG, along with other lunar orbiters, could form the core of a similar architecture in the moon’s orbit, enabling governmental, commercial, and international operations on and around the moon. One of the most unique advantages the DSG would offer to surface missions would be the ability for astronauts to control assets through telerobotics. Proximity to the lunar surface would eliminate the 10-second Earth-moon communication latency. This would greatly enhance scientific survey, assessment, and discovery. It would also enable precise repairs and robotic manipulation leveraging real-time human intelligence. With imminent advancements in virtual reality and laser communications, telerobotic operations at the DSG would allow for efficient new exploration of the lunar surface, at a fraction of the cost of sending astronauts to the lunar surface. Small lander services working in coordination with the DSG could dramatically reduce the cost of obtaining and returning lunar samples for analysis. Instead of launching a single mission to the moon and then returning samples all the way to Earth with the same spacecraft, samples could be retrieved by a robotic lander at multiple locations and delivered to astronauts at the DSG for delivery to Earth on Orion. Some samples could be brought to the DSG for a rapid analysis and allow for a much faster feedback loop to determine future sample missions. In the longer term, small lander services operating in coordination with the DSG could provide cost-effective demonstrations of the techniques, technologies, and operations needed for harvesting lunar water ice, storing it, splitting it into propellant, and transferring it to a spacecraft. Small landers could retrieve water ice on the surface, launch to the DSG, and demonstrate the first fuel depot in space. Advancement of ISRU at the DSG would be timely and logical. NASA’s upcoming Resource Prospector mission could obtain the first ground truth measurements for the utilization of water ice at the poles in the early 2020s, and small lander services with the DSG can follow up this groundbreaking mission with the next step in establishing ISRU from the moon. The DSG and small landers are exactly the kind of assets needed to drive down risk and take on an iterative approach for demonstrating the first commercial use of off-world resources. The promise of water ice at the moon cannot be overstated. An MIT study estimated that the cost of a Mars mission could be reduced by up to 68 percent by using the water ice on the moon. The utilization of this water ice would not only significantly reduce the cost of spaceflight beyond Earth; it could create the first resource market in space. The potential to advance ISRU in leaps and bounds at the DSG speaks to its potential of being a true gateway to deep space. Lastly, small lander services working with the DSG would offer NASA and other agencies the opportunity to test techniques needed for future deep space missions to destinations like Mars. By sending small landers to the surface and having them commanded by the DSG, demonstrations for 3D printing, surface module assembly, landing site preparation, and shelter building could be carried out at the moon as dress rehearsals for missions to Mars. The moon has always held great potential to be a proving ground for Mars, and small lander services can directly support the DSG’s stated primary purpose of advancing deep space exploration. As NASA conducts its 45-day review of plans for returning America to the moon and submits its findings to the National Space Council, the DSG architecture offers a smart and sustainable solution for re-establishing U.S. leadership in cislunar space. The DSG can be the core U.S. platform that supports a variety of orbital and surface operations that are in the national interest, and creates untold opportunities for commercial and international partners to contribute additional capabilities, such as landers, robotic arms, and other platforms. The DSG would be the ideal port for kicking off a sustained ecosystem in cislunar space, and a strategic means of capitalizing on the historic progress being made in the public and private sectors. It is the much-needed infrastructure to enable America’s return to the moon, as outlined by Vice President Pence, and cement our permanent and sustained future in space. John Thornton is chief executive of Astrobotic.